Time for gameweek 23 and here are our weekly picks for the fantasy team. Finally as sense and normalcy starts to get back into the EPL, it is time that we adjust our squad as per the changing scenario. Perfect time to use the wildcard, me thinks. Our midfielders this week are: Willian (7.2), Riyadh Mahrez (7.2), Georginio Wijnaldum (7.0), Mesut Ozil (10.0) and Bamidele Alli (5.5). four midfielders feature in our playing 11, them being Willian, Mahrez, Wijnaldum and Ozil. Forwards: Romelu Lukaku (9.2), Aleksandar Mitrovic (6.2) and Sergio Aguero (13.3). Mitrovic earns his place in the team owing to some noticable performances in recent games, mind you that in the last 6 gameweeks, he has had more shots inside the box (20) than any forward that period ahead of a trip to Watford. Thanks for reading guys, hope this helps!! 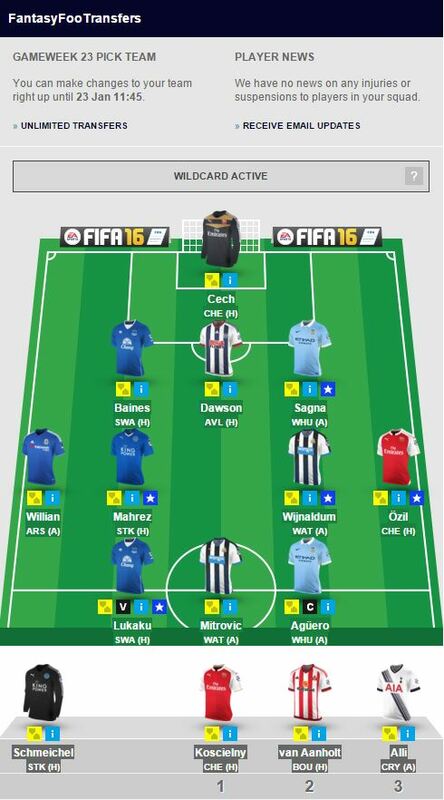 This entry was posted in Squad and tagged english premier league, Fantasy Football, FPL, Transfer Tips. Bookmark the permalink.